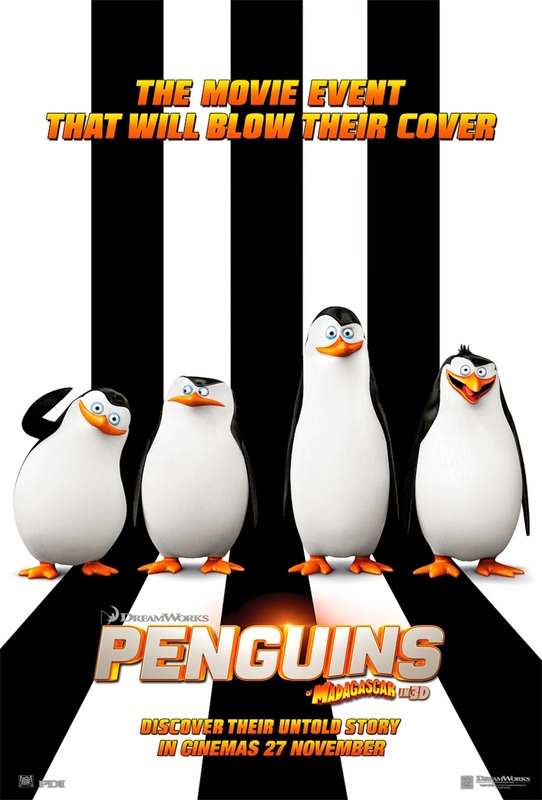 This extremely pacy nonsensical comedy is a spinoff of the Madagascar films featuring the Penguins as the standalone main characters. 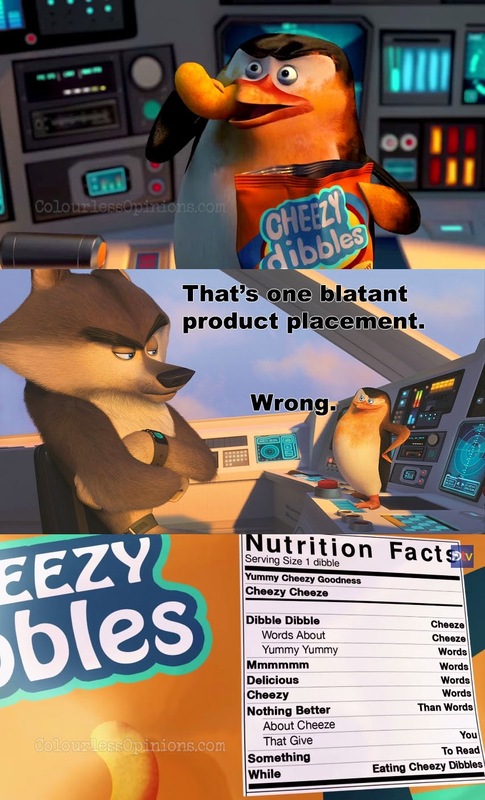 The story takes place right after Madagascar 3: Europe’s Most Wanted where the titular protagonists feel sick listening to the song I Like to Move It and decide to leave Alex and the others to find some Cheezy Dibbles, their favourite snack. At their destination, the Penguins gets captured by the evil Dave / Dr. Octavius Brine, who blames them for overshadowing him back at the zoo and plans to have an ugly revenge on all penguins. To stop him, the Penguins join forces with a highly professional undercover organisation called The North Wind. 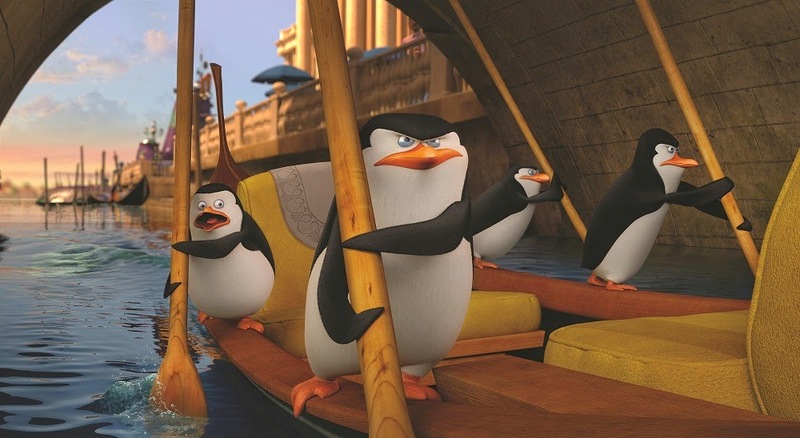 Penguins of Madagascar is certainly an underdog among the other Hollywood animated features released in 2014, and there’s no shortage of this kind of anti-Bond espionage parodies, but it’s not possible to totally dislike the hilarious Penguins when these bold elites maintain their foolish nature. 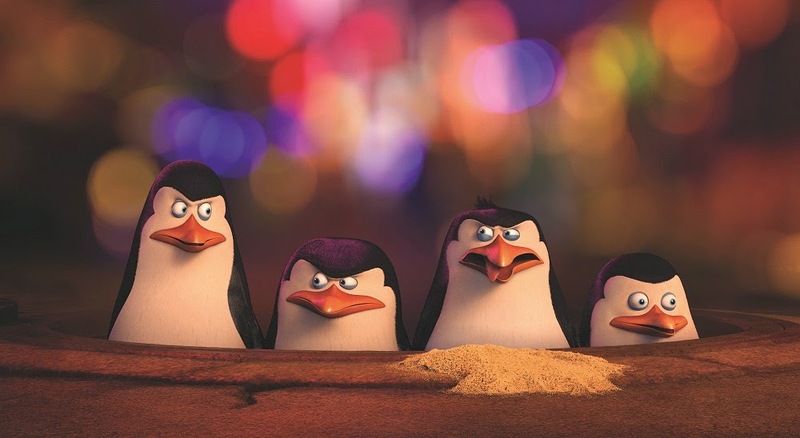 The Penguins are Skipper the leader who always have a plan, Kowalski the intelligent one who can always say something smart, Rico the one who eats literally anything, and Private the rookie who hopes to be a valuable member of the team. The film has flashbacks showing the beginnings of the characters before they decide to become this team of animal-helping super spies. The North Wind characters are, sadly, boring new additions. It’s Benedict Cumberbatch’s (Star Trek into Darkness, Sherlock TV series) debut in voice acting in an animated film (he voiced the dragon in The Hobbit: Desolation of Smaug though) but his role as Classified, the leader of the group, is disappointingly too ordinary while the usually controversial funnyman Ken Jeong (The Hangover trilogy) is practically sidelined and restricted with a limited lines as Short Fuse. But delightfully, Tom McGrath’s (who co-directed the Madagascar trilogy with the co-director of this spinoff, Eric Darnell) performance as Skipper and Christopher Knights’ (Shrek 1-4) as Private managed to be the exact opposite of that, providing the strong comical energy that film needs to compensate the lack of the presence of the other main characters from Madagascar. The antagonist Dave / Dr. Octavius Brine the octopus is also faultlessly villanised by the voice of John Malkovich (Red 1 – 2, Being John Malkovich). The film’s not pretentious, it doesn’t try to have heart, it doesn’t have any forced emotional moments or does it even bother being morally correct (it sort of contradicts itself with its message about how looks shouldn’t matter). It also abandons the slightly more logical Madagascar universe to feature the new North Wind characters who’re also animals but actual professional spies with weapons and an aircraft worth millions. But this ain’t Disney or Pixar, and they just don’t care. The Penguins just sticks with its slapstick and pop culture humour, and maintains its level of nonsensical silliness and ultra-lightheartedness throughout the film. Although the designs don’t display mad creativity, the visuals are competent, colourful, well-animated and tightly edited. More importantly, the film carries sufficient laughters, with the cheezy dibbles scene being the most hilariously one (unfortunately already shown on trailers). Yes, the plot may be utterly uninspiring, formulaic and predictable, but hey, so is Disney’s Big Hero 6, which the critics loved so much. I was actually more disappointed that the film also follows the second act cliche of having a moment of protagonist setback and self-evaluation instead of just having the Penguins to be their fearless selves all the flippin’ way, disastrous but always winning, and never losing their confidence regardless of the situation. Might as well right? The personality of these characters are supposed to be like that but unfortunately, the directors (Simon J. Smith and Eric Darnell) and writers (Michael Colton and John Aboud) decide to throw that away just to keep the typical plot structure. Perhaps Tom McGrath’s co-directorial input was greatly missed. One could accuse it for being a lazy, unimaginative animated film compared to the big ones this year like The Lego Movie, Mr. Peabody & Sherman, How to Train Your Dragon 2 and Big Hero 6, and it’s foreseeable that it may not receive critical acclaim and it definitely wouldn’t win Best Animated Feature in the coming Oscars, but I doubt the makers actually took it that seriously to begin with. It’s also obvious that they didn’t set out to surpass any of the Madagascar films either. If you’re one of those who only wanted to see more of the Penguins and not so much of the others in Madagascar, you’d likely be satisfied with this spinoff enough to probably never ask for another one. Post-credit scene: There is a mid-credit scene featuring a cameo appearance of King Julien and Mort but I did not stay to see if there’s another scene after the closing credits as I highly doubt that’s going to be one. Censorship in Malaysia: Nothing seems to be cut at all at the press screening held at IMAX TGV 1 Utama, and I highly doubt there was anything to censor anyway. It’s rated U! To watch in 3D? Since I actually forgot that I was watching in 3D to the point that I almost didn’t take off the glasses before walking out of the hall, I guess I just can’t recommend it to adult audience. Second opinion: My girlfriend actually liked it more than Big Hero 6. Verdict: Everyone’s gotta have a guilty pleasure once in a blue moon, even critics do, and this one’s mine. The title is just purely joke, right? I thought his name supposed to be Benedict Cumberbatch. Thanks for informing about the typo. Cucumbatch is indeed funny though.